I live in Utah, but my parents and brothers still live in Toronto, Canada, where I’m from. This makes for a lot of flight time each year. When I was a newlywed, flying back and forth to see my family was more boring than anything. I’d kick back, read my book, and even have a nap before a hit home. But fast forward a few years, and I now have a six-year-old and a three-year-old tagging along. In other words, my days of napping on the plane are over. 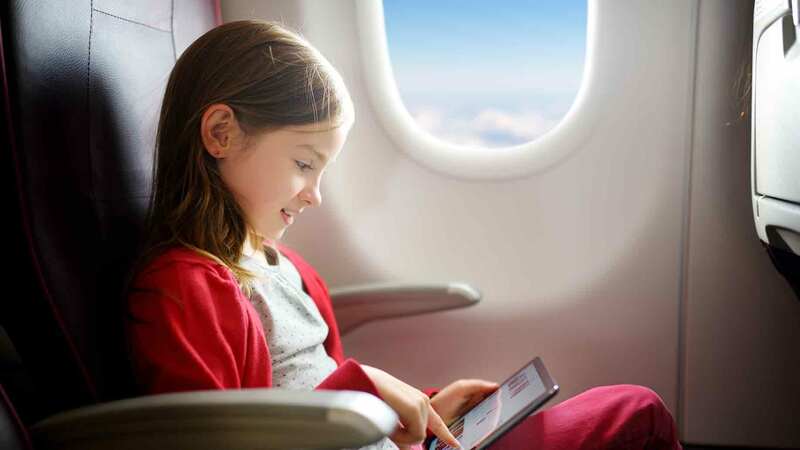 Traveling on a flight with young children can be difficult – you may already know this. But you may not know how to make the experience easier, not to mention, more enjoyable. Since we travel to Canada about three times each year, I’ve become well acquainted with the process of flying with kids. The first time I took my kids along, I was terrified of being “that mom.” You know, the mom who has to deal with dirty looks because her kids won’t calm down? So in an effort to keep everyone quiet, I searched beforehand for the best ways to entertain kids in-flight without spending a fortune. One of the first things I do when preparing for a trip is to head to the dollar store sans kids. There, I grab a ton of brand-new toys, games, puzzles, and coloring paraphernalia – whatever I can find. I don’t want to bring any of my kids’ pricey toys on the plane because they could get easily lost – and besides, my kids love getting new stuff. The dollar store trip covers it; during the flight, I can pull out new coloring books or stamp pads to keep them busy, and since they were only a buck each, I don’t care if they get lost or broken. My kids especially love the packets of foam stickers. We flip up the seat tray and they create scenes with them on the back. Plus, they peel away easily when the plane touches down. I learned long ago that over-packing your own bag just leaves you digging for diapers, cups, toys, and blankets for the entire flight. So I bought each of my kids a rolling backpack with their favorite characters to take as their carry-ons. Now, each gets their own backpack, snacks, and comfort items, leaving space in my bag for the important stuff, like passports, IDs, and my cell phone. Plus, my kids love rolling their “suitcases” through the airport, which means fewer tantrums on the way to the gate. My kids are seasoned enough that they know exactly when to take off their shoes and how to get through security. But I also make it a lot easier by dressing them appropriately. For instance, if we have an early flight, I let them sleep in comfy sweats so I can transport them directly from their bed to the car – they catch a little bit more shuteye on the way to the airport, which means less chance of a complete meltdown later in the day. I also make sure they have comfortable shoes that slip on and off. I have enough to deal with in the security line, so they know to grab their shoes and put them on themselves. Many airports offer some type of children’s play area. If you can’t see one on the terminal map, ask at the information desk. Having a place where my kids can burn off energy before boarding has been a complete lifesaver. In fact, I now plan layovers around which airports have a play area and which don’t. Since I don’t travel with a stroller anymore, I dress the kids in bright shirts that are easy to spot so I never lose sight of them while they’re playing. This also gives me a few minutes of downtime to make phone calls and take a breather before we’re on the next plane. I know my kids will eventually get tired of all the activities in their bags and just want to kick back while we fly. That’s why I never leave home without an iPod or portable DVD player. I load up my iPod with kids’ movies and use the inexpensive jack splitter I bought from the electronics store so both kids can plug their headphones in and watch on the same device. Then I get a few quiet moments to finally flip through a magazine. We all know that airport food costs a pretty penny. I usually splurge on kids’ meals if we have a lot of layover time, but otherwise my kids are just as happy to nosh on packed snacks on the plane. Just look for snacks that won’t roll away or get messy: Goldfish crackers, fruit leather, trail mix, and pretzels are all kid-approved on our flights. I also check to see if the airline offers any type of in-flight snack box. It’s usually about $5 and filled with different treats that my kids can divvy up, which helps keep them busy and happy. I remember flying alone and simply ordering whatever I wanted from the drink cart. But kids don’t do well with super-full airline cups. That’s why I always bring a couple of empty sippy cups along. My six-year-old is old enough to go without, but there’s still a lot of jostling and bumping in-flight. Once their drinks arrive, I simply pour them into their cups. That way, I don’t panic every time we hit a patch of turbulence. The best tip I can offer for flying with kids is simply to relax. There are always going to be some hiccups, but nothing you can’t handle. In a worst case scenario you’ll be delayed – so if you have babies, be sure to carry on enough diapers and formula for 24 hours in case this happens. Being flexible will go a long way toward having a good trip. That’s why I tend to be a little lax in my parenting when traveling. It’s exciting, but it’s also stressful for kids. So I allow my kids to drink soda, watch five back-to-back episodes of “SpongeBob SquarePants,” and have snacks I wouldn’t otherwise allow. After all, it’s only for a few hours. 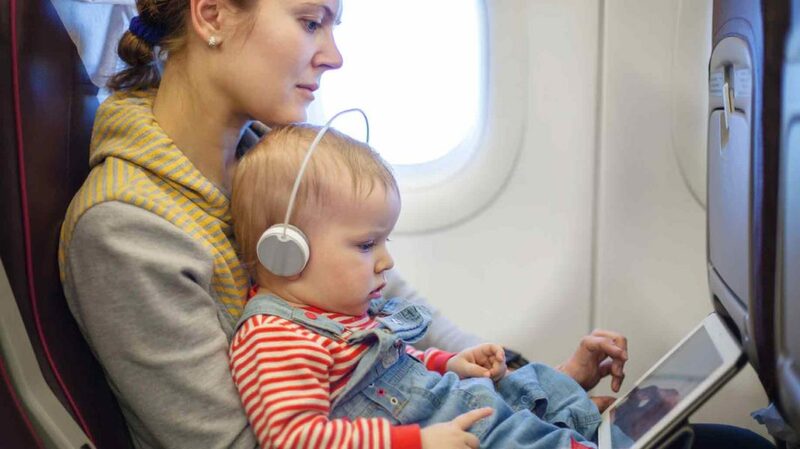 What are your best tips for flying with little ones?